A special thanks to the librarians and staff at the Honnold – Mudd Special Collections at the Claremont Colleges Library for supporting my work with this volume and Scripps College student Elisabeth Mayer for analyzing the annotations in The Tempest. Way back in December I attended a symposium on annotated books organized by Philip S. Palmer at UCLA’s Clark Library. An engaged group of scholars and librarians made for a day filled with lively conversation. The symposium threw me back into discussions about marginalia and metadata, digitization and materiality, teaching paleography, hybrid books, and other topics at the intersection of manuscript studies and project design. In the flurry of research and teaching at a new institution, I hadn’t yet explored the collections at my new institution, Scripps College, as much as I’d hoped. If you’ve been reading here, you’ll know that planning my “What is a Book?” course and symposium changed all that. When I was in Honnold – Mudd Special Collections at the Claremont Colleges Library preparing Shakespeare materials to show students in all three of my courses, Gale Burrow (Outreach & Public Services, Special Collections and Liaison Librarian for British and American Literature) brought out a copy of the Fourth Folio of Shakespeare’s works (1685) that I hadn’t seen before. We opened it and realized that it was full of manuscript annotations. I announced our discovery on twitter, Gale Burrow and Carrie Marsh (Director of Special Collections and Libraries) added it to the digitization queue (watch for it on the Claremont Digital Library), I showed it to all my students, it even inspired a final research project by one of my students, but it’s taken me a few months to get back to writing about it here. This copy of the Fourth Folio, or F4, (call number PR2751 .A4 1685, HON SPCL PHIL 1) was given to Pomona College as part of the Norman D. & Geraldine Womack Philbrick Library of Dramatic Arts and Theatre History. I drew heavily on this extensive collection of theatrical materials whenever I brought my Shakespeare courses to visit Special Collections. The Philbricks purchased this F4 from Dawsons of Pall Mall in 1971. Previous owners pasted a bookplate in the inner cover with a coat of arms that was later identified in a pencil annotation as the arms of Shuttleworth Sheatfeild. This F4 is bound in stamped calf typical of the late seventeenth and early eighteenth century. The binding shows signs of repair, but not rebinding. None of the annotations are trimmed. The iconic Shakespeare portrait is missing and has been replaced with a facsimile. 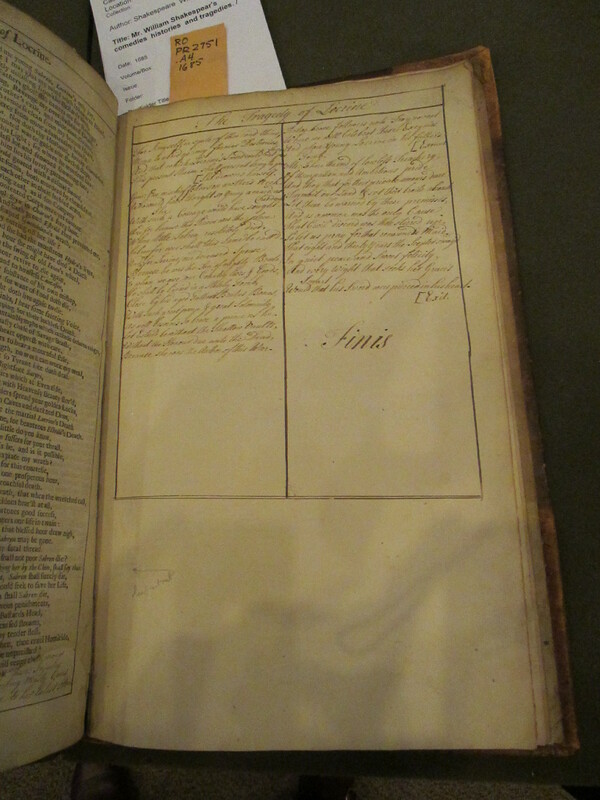 There are manuscript annotations throughout the entire printed book. Scripps College student Elisabeth Mayer analyzed all of the annotations in the first three scenes of The Tempest and identified 233 unique changes in punctuation and word-choice, and other markings perhaps related to scene division. My analysis of this volume is still largely preliminary and there is much more detailed work to be done to transcribe and categorize the wide array of markings in this book. The comedies receive the most attention and, to my chagrin, the history plays receive the least. But even among the comedies our annotators are selective and perennial favorites like Twelfth Night are left alone. From my preliminary analysis, I think the annotations fall into four broad categories: lexical correction, mark-up for performance, collation and scholarly inquiry, and completion. These categories roughly align with the four different hands I’ve identified in the book. Hand 1 is a seventeenth-century hand that only appears in the volume’s preliminaries. This annotator personalized the table of contents by adding the page number for the start of each play and listing the new plays added in the Third Folio (F3, 1664) with page numbers as well. This hand favors secretary hand letter forms that are not present in the other hands in the book. The second hand is standard eighteenth-century handwriting and it is the most common hand in the book. I may be grouping a few people with similar handwriting into the Hand 2 category. These annotations are most commonly lexical corrections, even on Folio-only plays where no collation with the Quarto tradition would explain corrections, or performance mark-up, cuts and notes that imply that this volume was used for household or amateur theater. Annotations on The Tempest mark lexical and grammatical changes as well as the setting of various scenes in different parts of the island. In Measure for Measure notes are largely lexical and grammatical as well, with the addition of largely inscrutable long brackets. The Comedy of Errors is the first play in the volume with substantial cuts marked with large Xs, but these marks also appear in Love’s Labour’s Lost and other plays. At the beginning of A Midsummer Night’s Dream the annotator has added a comprehensive dramatis personae list. Annotations in Taming of the Shrew add text, likely from the quarto tradition. Many of the cuts, minor lexical changes, added scene breaks and locations, and notes about asides and direct address are all indications that the Hand 2 annotator had performance in mind. While we’ll never know exactly when or how this F4 was used in performance, the annotations show readers concerned with theatrical conventions. The third hand is engaged in scholarly endeavors. This annotator mentions the Quarto printed additions of the play as well as Lewis Theobald’s Shakespeare Variorum (1726). The direct citation of Theobald in a note on Hamlet helps date these annotations firmly to the eighteenth century and the handwriting suggests that these erudite notes are likely from the later half of the century. The fourth hand plays a minimal role in the volume. It appears that at some point the last leaves were damaged and the volume ends with late eighteenth or nineteenth-century manuscript additions completing the Tragedy of Locrine. Thinking with annotated books is slow and painstaking work. The Honnold-Mudd F4 suggests quite a few ways that readers might have used their Shakespeare in the eighteenth century. From single-word corrections to performance cuts, scholarly notes to page numbers, this F4 was annotated by at least four interested readers. There’s much more to be done here, first of all, completing a survey of all the annotations. A full analysis will either deepen or disrupt the schema I’ve presented here. As I continue to work on this F4, I plan to keep using it in my teaching. I’m excited to see what else my students and I can find.